Kariginu (Formal Outer Robe for a Male Role in the Noh Theater), Japan, 19th century. Silk, gold leaf paper strips, satin and supplementary weft weave. Gift of Mrs. Charles M. Cooke, 1928 (2557). Gold, one of the earth’s most treasured metals, possesses an undeniably luxurious appearance. Found relatively pure in nature, it is the most malleable of metals—an ounce of gold can be beaten into 300 square feet. This rare metal will neither tarnish nor corrode. Golden Opportunities illuminates our fascination with golden embellishments as a mark of power and prestige in human adornment. Throughout history and across borders, gold enhancement offers a glimpse into the glory of the affluent and influential, bestowing a glow of exaggerated richness. 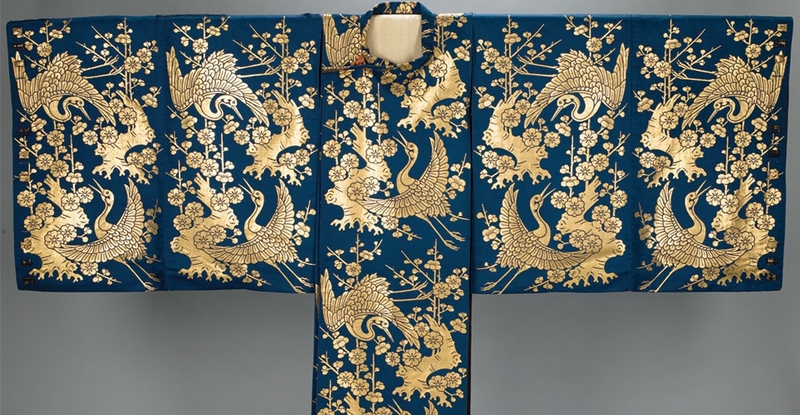 Opulent and ostentatious, filaments of shimmering gold were woven and embroidered and metallic pigment was printed and stamped on cloth as a statement of conspicuous consumption. The exhibition will feature extraordinary costumes from a multicultural assortment heralding the magnificence of gold: Mughal coats and saris from India; Noh robes and priest’s kesa from Japan; Manchu dragon robes, auspicious wedding attire, and Taoist priest’s robe from China; chasubles and a matador’s regalia from Europe; and gilt-painted batiks and ceremonial skirts from Indonesia. These undeniably exquisite garments are worn in public forum, and are a confrontation of our own human desire for acquiring wealth.